Edge computing, the cloud and digital twins were among the dominant themes at this year’s Hannover Fair, the world’s largest industrial exhibition. But despite the show being bigger than ever with the addition of the CeMat logistics show, visitor numbers dipped slightly. Have we hit “peak Hannover”? This year’s edition of the world’s largest industrial trade show attracted 210,000 visitors – down from the 225,000 who attended the 2017 event, despite the biennial CeMat logistics show running alongside the Fair for the first time, and the presence of the now-annual MDA (Motion, Drives & Automation) show-within-a-show, which was not held in 2017. Despite these statistics, you would be hard-pressed to notice any easing of the crowds at the fairground. Visitors had a choice of 5,800 exhibitors to see in almost 30 vast halls. About 30% of the visitors were from outside Germany with China sending the largest delegation (around 6,500 people), followed by the Netherlands (5,300), Poland (2,700) and the US (1,700). As in recent years, Industry 4.0, digitisation and the cloud were omnipresent themes, but one area where there was a noticeable amount of activity in 2018 was edge computing, with new or enhanced offerings from the likes of B&R, Harting, Hewlett Packard, Phoenix Contact, Rittal and Siemens. In some ways, edge computing is the opposite of cloud computing with processing taking place as close as possible to an industrial process for enhanced security and reduced latency and network jitter. Below, we highlight some of the products and technologies that were on show in Hannover this year. 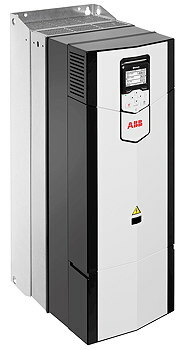 ABB launched a new generation of regenerative drives that capture energy from motor braking that would otherwise be wasted as heat. The regenerative ACS880 VSDs (shown below) cover ratings from 4–3,200kW and are available in wall-mounting versions (ACS880-11), built-in modules (ACS880-14) or cabinet versions (ACS880-17). The regen drives avoid the need for external braking components, cut cabinet costs, and can boost motor voltages to ensure reliability in unstable network conditions. On its stand, Baumüller was using the example of a servo press to demonstrate how “digital twins” can be used to model and simulate the behaviour of machines before they are built. As well as reducing development times, the technology can simplify commissioning, and allow software functions and control algorithms to be tested at an early stage on the virtual machine, reducing the risk of errors. Baumüller also announced new axis modules for its b maXX 5000 modular servodrive system, taking the top rating up to 240kW (430A). The Danish integrated servo and stepper motor specialist JVL unveiled a compact stepper motor that supports six different industrial Ethernet protocols (that are upgradeable) and includes an absolute multi-turn encoder. 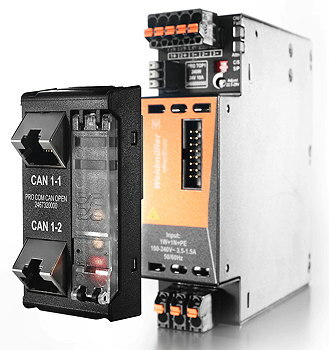 The MIS171/176 motors can operate either using built-in motion controllers or from an external PLC or PC. Eight I/O points can be configured individually as digital inputs or outputs, or analogue inputs. The motors can achieve resolutions of 409,600 steps per revolution, speed precision of 0.01 rpm, acceleration precision of 1 rpm/s, and speeds of up to 3,000 rpm in 0.01 rpm steps. They offer peak ratings up to 100W and 1Nm, and 254 axes can be connected to one RS-485 bus. Lafert, the Italian motor-maker being acquired by Japan’s Sumitomo, launched a new generation of IE3/Nema Premium AC motors, a range of IE4/5 synchronous PM motors with claimed weight and size savings of up to 50%, and an upgraded family of synchronous PM motors with built-in drives for large-diameter ventilation fans. There was also an extended range of brushless servomotors with torque ratings up to 390Nm. Lenze has put together a scalable drive package consisting of its i950 servo-inverter, m850 synchronous motor and g700 planetary gearbox that, it says, will allow cost-effective production, even for batches of one. The package is aimed at applications such as positioning, handling, assembly, robotics, packaging and conveyors. The servo-inverter’s built-in EtherCat port allows users to control multiple axes synchronously at high speed, to perform complex tasks. Nord Drivesystems highlighted a decentralised, networked drive technology using “field distributors” with built-in PLCs that can perform process control and regulate processes autonomously. The Nordac Link distributors (above), designed to be mounted close to a motor, are available as frequency inverters up to 7.5kW or motor starters up to 3kW. They incorporate PLCs that process data from sensors and actuators and, if necessary, they can initiate sequence control and transmit drive and application data to a control centre, to other components or to the cloud, where they can be used for predictive maintenance. Pilz was demonstrating an energy store for its PMCprotego D and PCtendo DD5 servo amps that buffers braking energy without feedback to the network. Because the amp’s intermediate circuits can be connected easily to each other, only one PMCenergy SD store is needed per axis. Schaeffler offers flanged motor housings for motor manufacturers, which are supplied as ready-to-fit modules incorporating rotor bearing supports, seals, and bearing housings. The latest development is to incorporate the company’s SmartCheck condition-monitoring system (shown below) which detects irregularities, such as bearing damage and imbalances, based on solid-borne vibrations. It can be used with a control system to trigger impulses for a grease lubricator, to prevent over- or under-greasing to the rotor bearings. Although there are no legal requirements for the minimum efficiencies of explosion-proof motors in Europe, SEW-Eurodrive is offering a range of IE3 motors that comply with the Atex directive and IECEx. The EDRN motors (based on the DRN series) cover ratings from 0.75–200kW and are no bigger than IE2 motors with comparable ratings. They can be operated on the grid or a voltage-controlled frequency inverter, and are available with IP55, IP65, IP56 or IP66 protection. SEW has also has added two new sizes to its Movitrac LTE-B+ range of basic frequency inverters, taking the number of sizes to five, and spanning ratings from 0.37–37kW in single-phase (115V and 230V) and three-phase (230V and 400V) versions. IP20 or IP66 protection is available. A further development announced by SEW is a new surface protection for drives used in the food and beverage industries. In independent tests, the XCO coating has withstood exposure to saline sprays for extended periods. It is available as an option for some SEW helical and helical-worm gearboxes in combination with aseptic motors. As usual at Hannover, Siemens was showing several additions to its drives and motors portfolio, including a new frame size (FSAC, spanning 1.1–1.5kW, 200–240V) for its Sinamics V20 converter family, that is 40% smaller than the FSB frame which it replaces. The smallest frame size for the Sinamics V90 servodrive family is now the FSA (0.1–0.2kW) which has a 18% smaller footprint than the earlier FSB, and supports Profinet. Siemens has also improved the mechanical and electrical design of its Sinamics S120 Chassis-2 modular drives, which are now up to 60% narrower and have a new cooling concept using speed-controlled fans. Derating has been more than halved at low output frequencies. A firmware update to Siemens’ Sinamics S210 servodrive system has added the SS2, SOS, SLS, SSM, SDI and SBT safety functions to the previous STO, SS1 and SBC functions. The encoders of the compatible Simotics S-1FK2 motors have been updated to support the new safety functions and to provide a resolution of 22 bits. Siemens’ final new drives development is an option that provides wireless commissioning, diagnostics and servicing for its Sinamics G120 converters. The G120 Smart Access Module allows wireless connection to devices such as smartphones and PCs. On the motors side, Siemens announced a range of IE3 low-voltage motors that complete its new generation of LV motors. The multi-voltage Simotics SD Pro motors (above) are suitable for mains or converter operation up to 690V and are available in shaft heights 315–450, and in two- and four-pole versions from 250–980kW. There are also six- to eight-pole versions. The terminal boxes can be mounted in 40 positions. There is also a new generation of explosion-proof LV motors available from Siemens on short delivery times and claimed to cut lifecycle costs. 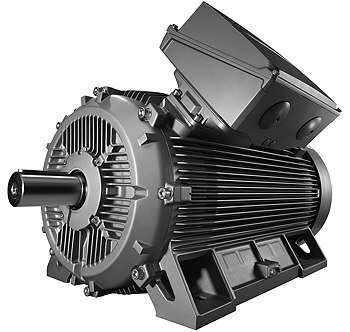 The IE3-rated Simotics XP motors are available for Zone 1 in Ex db eb (0.25-460kW) and Ex eb (0.25-165kW), and Zone 2 in Ex tb (0.09-200kW) and Ex tc (0.09-200kW) versions. Finally, Siemens has expended its high-efficiency Simotics synchronous-reluctance motors to include new shaft heights (AH90 and AH225). The motors now cover the range 0.55–45kW and offer rated speeds of 1,500 and 3,000 rpm. Another development now allows enoderless closed-loop torque control down to a standstill, eliminating the risk of the motor stalling, even if the load inertia is not known. ABB announced a range of multi-touch touchscreen HMIs that are compatible with its AC500 and AC500-eCo PLCs. The CP600-Pro panels come with 5, 7, 10.1, 15.6 or 21.5” screens and offer IP66 front protection. There are three Ethernet ports (one of them 10/100/1000Mbit) supporting up to three networks, as well as serial and USB ports and an SD card slot. The HMIs support the OPC UA pub/sub server and client protocol. 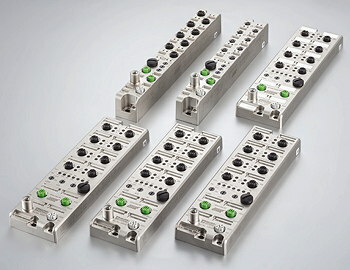 Beckhoff has added four EtherCat I/O terminals (below) to its portfolio, targeting energy management applications. They are: the EL3443 three-phase power measurement terminal with mains monitoring functions and harmonic analysis; the EL3453 three-phase terminal for measuring voltages up to 690V AC; the EL3423 “economy” three-phase power measurement terminal; and the EL3483 three-phase mains monitoring terminal for voltage, frequency and phase. ABB subsidiary, B&R Automation, launched one of several edge controllers that made their debuts at Hannover. Based on its Automation PC 910, the Edge Controller (below) runs a hardened version of Linux and can be used for data analysis and machine learning. Cloud transmission occurs via MQTT. B&R’s Hypervisor allows a real-time operating system to run simultaneously, turning the device into a full industrial controller with sub-millisecond cycle times. An unlimited number of I/O modules or controllers can be connected via Powerlink, OPC UA or other systems. In the future this will also be possible with OPC UA TSN. 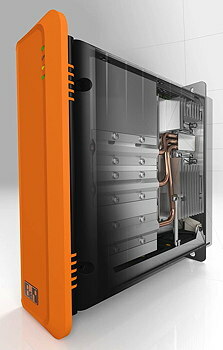 KEB has extended its range of industrial PCs with a compact book-mount model with all of its ports and connections on the top and front. The fanless, aluminium-housed C6 P34 BM PC offers an optional remote video link port for installing monitors up to 100m away. Another option is remote maintenance up to the drive level, without needing any extra hardware. Pepperl+Fuchs was showing an industrial tablet for hazardous areas that it is selling under its ecom brand. The Tab-Ex 02 tablet (based on the Samsung Galaxy Tab Active2) simplifies data-exchange with Scada and DCS systems and can be used for inventory, material-tracking, asset management and maintenance applications. It is also suitable for augmented-reality applications. 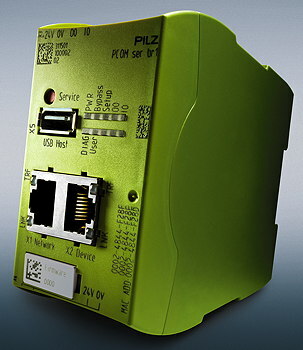 Pilz is expanding into industrial security with its SecurityBridge product (below) which is designed to protect its PNOZmulti controllers and PSS 4000 automation system from network-based attacks and unauthorised access. It detects unauthorised changes to automation projects to protect connections between programming tools and hardware controllers. It also acts as a plug-and-play firewall that does not need complex configuration. Pilz is planning to develop other TÜV-certified security products in accordance with IEC 62443-4-1. Siemens announced several new CPUs for its Simatic S7-1500 Advanced Controller family. First, there are two new technology CPUs (the 1515SP PC2 T and the failsafe 1515SP PC2 TF) that combine safety, motion and standard control functions and can be used for tasks such as gearing and camming, and for controlling kinematic applications with up to four axes. There are also three new redundancy CPUs (the CPU1513R and CPU1515R for smaller applications, and the CPU1517H for larger applications) that take control of processes automatically, with no loss of data, if one CPU fails. Field devices are connected to the CPUs via a Profinet ring, so that all nodes are still accessible if the fieldbus is interrupted. Block unveiled two 24V/40A DC UPSs (uninterruptible power supplies) that ensure availability of safety-critical systems if the power fails. The supplies supports 12, 24 and 48V systems and can use either battery or ultracapacitor energy storage. The battery versions provide immediate back-up with a hold-up time that can be adjusted by adding extra battery packs. The low-maintenance ultracapacitors provide support for a few minutes and their long service lives make them ideal for remote applications. They offer high power densities and parameter setting via a USB port and rotary switch. 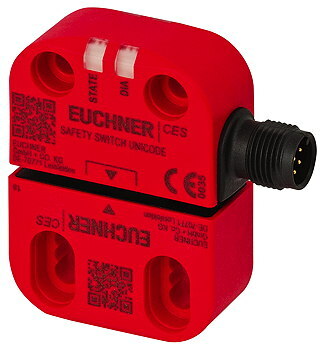 Euchner was showing various enhancements to its safety portfolio, including: its smallest safety switch, the CES-C07 (above), which not only connects sensors in series, but can also monitor parameters to indicate problems before a machine fails, or to detect tampering attempts; the 18mm-wide ESM-CB safety module which polls information automatically from each safety switch in a chain, and sends the data via IO-Link; a modular safety door protection system (the MGB2 Modular), which adapts to suit the user’s needs, and can integrate up to six different controls in a locking module; a compact safety door protection device which combines Euchner’s MGB handle module with its CTP transponder-coded safety switches; and a new version of the EKS electronic key system with a USB port for access control and management, and connection to PC-based controls. 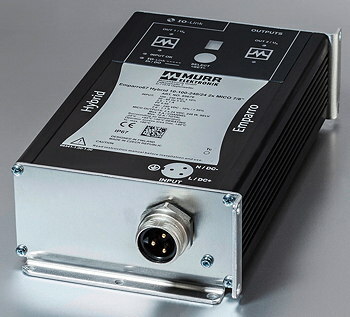 Murrelektronik’s Emparro67 Hybrid power supply (below) is an IP67-protected device that relocates 230V AC to 24V DC power conversion from the control cabinet to the industrial field, near the load, thus minimising losses, cutting energy costs and allowing smaller cabinets to be used. A built-in IO-Link interface can transmit diagnostics and operating data to a master. Two Mico channels provide electronic current monitoring of sensors, actuators and fieldbus modules. 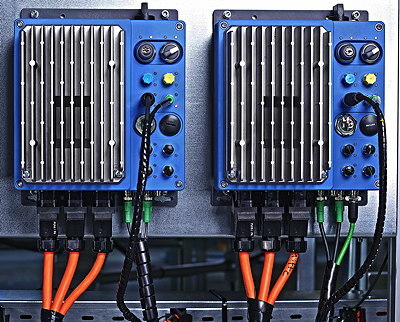 Nord Drivesystems is offering an interface module that integrates safety components with its Nordac Link, Flex and Pro inverters and provides secure communications in Profinet environments. The SK TU4-PNS ProfiSafe module can be installed in cabinets or decentralised. 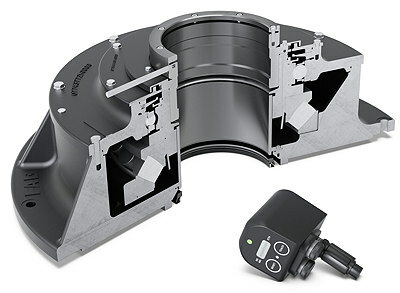 Safe inputs and outputs – for example, emergency-stop switches and light barriers – can be connected to an application, while a rotary encoder can be used to supervise safe drive functions. The module can be used to integrate safety functions including SLS, SSR, SDI, SOS and SSM. Phoenix Contact claims to have the world’s first type 3 surge protection device for industrial power supplies. The device provides 5kA of discharge current and is available in versions from 24–230V AC/DC. A push-in fast connection technology allows tool-free installation, while a remote indication contact identifies the operating state of the device. Also new from Phoenix is a networkable UPS with interfaces for Profinet, EtherNet/IP, EtherCat or USB. These ports can be used for energy and function monitoring, parameterisation, and shutting down the system. The Quint DC UPS is available in four versions with ratings from 5–40A. Pilz unveiled a new version of its PSENmlock safety gate sensor with series connection, that it describes as “the world’s first intelligent safety sensor for individual control”. When used with its Safety Device Diagnostics technology, the system allows targeted control of individual switches, avoiding the need for costly individual wiring in control cabinets. The diagnostic capabilities mean that downtimes should be reduced. Pilz also has a new pushbutton device for the simple operation of safety gate sensors. The PITgatebox supports commands to activate, stop or reset machines. 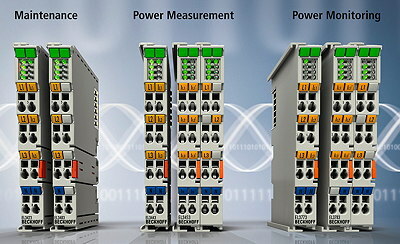 Pilz also introduced two new modules for its PNOZmulti 2 configurable safe controllers. One (PNOZ m EF 8D12DOT) is a dual-pole, semiconductor output module for monitoring press applications, which allows fast reaction times. The second (PNOZ m EF 4AI) is a safe analogue input module which can perform arithmetic functions such as averaging or differential pressure calculations, making it easier to configure analogue values. 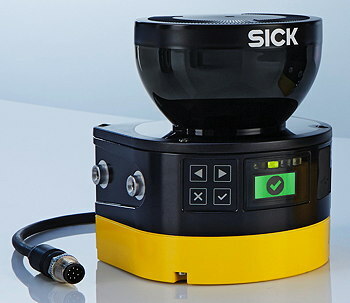 New from Sick is a safety laser scanner for robotic and vehicle applications that provides up to eight simultaneous protective fields, and 128 individual fields, with up to 128 monitoring scenarios. The microScan3 Pro scanner (below) can monitor the movements of robots and vehicles such as AGVs in fine gradations, resulting in better movement continuity with fewer stops. The scanner has interfaces for ProfiSafe and EthernNet/IP CIP Safety, offering greater flexibility for integration. Siemens has developed a device that, it says, combines residual current and overload protection in one modular width (MW) for the first time, halving the space normally needed. The 5SV1 RCBOs (residual-current circuit-breakers with overcurrent protection) are designed to protect both personnel and equipment. In the event of a fault, they disconnect all circuits from a network. The compact size allows more protective devices to be fitted in a given space, and for existing installations to be expanded more easily. Siemens has also developed an arc fault detection device with integrated line protection in one MW – another first, according to the company. The 5SV6 device detects arc faults in cables at the same time as protecting against overloads and short circuits. Siemens has upgraded its Sitop PSU8600 power supply by adding modules that transform into a DC UPS. The UPS8600 modules used energy stored in battery modules to keep a system running if the power fails, and extend the previous bridging times from minutes to hours. The power supply has 36 outputs that can be adjusted from 4–28V and all can be buffered in the event of a power failure. Certain outputs can be shut down selectively. Wago unveiled four- and eight-channel electronic circuit breakers (ECBs) for protecting applications with 24V DC supplies. The Epsitron devices are said to be much narrower than equivalent conventional breakers. IO-Link is built in, allowing status monitoring, remote parameter setting and integration with higher-level controls. Nominal currents can be set individually by channel. 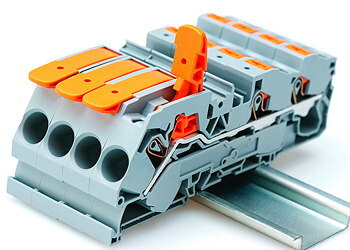 Wago also announced two new ways to wire its Top Job S rail-mounting terminal blocks, in addition to the traditional operating slot. One uses pushbuttons and a clamping point that is opened with any hand tool. The orange pushbuttons distinguish the actuator from the conductor entry, which accepts conductors with cross-sections from 0.14–25mm2. The second uses a lever to open and close the clamping point. This design (above) frees up the user’s hands for difficult-to-bend conductors with large cross-sections (2.5, 6 or 16mm2). All three methods support push-in connections which allow fine-stranded conductors to be plugged into the terminal block. Weidmüller has produced a retrofittable communication module for its high-end Protop power supplies, allowing product and condition data to be transmitted to higher-level controllers and the cloud. The plug-in Pro Com module (below) adds value to machine and production data, using analytics to improve the speed, flexibility and efficiency of plants. 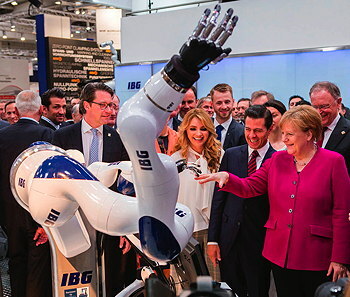 After opening the 2018 Hannover Fair, the German chancellor Angela Merkel toured the exhibition, including a visit to the IBG Automation stand where she was greeted by a five-finger robotic “hand” on the end of a robot arm (below). The Schunk SVH gripper, which contains nine drives, has been certified for use in collaborative applications with humans. It is similar in size, shape and mobility to a human hand and has been designed for applications in assistance and service robotics. It incorporates open- and closed-loop controls and power electronics in its “wrist”. Igus has combined its bearing and energy chain expertise to produce a roller chain for long travel distances, whose service life has been more than doubled by using new tribologically-optimised, lubrication-free plain bearings in the chain links. Optionally, the P4.1 chain can be equipped with wear (and other) sensors that can warn when maintenance is needed. Igus says that roller chains used in container cranes can now last more than 15 years or more than 20,000 operating hours. SEW-Eurodrive in tapping into the market for parallel kinematics robots with a new business called Maxolution Machine Automation which offers compete mechatronic sub-systems such as two- and three-axis robots. The company is pooling its expertise to offer scalable market- and application-specific robot mechanics and axis packages, including items such as axis modules, servomotors, servogears and software. SEW also announced ranges of parallel-shaft helical (FM/FAM) and helical-bevel (KM/KAM) gear assemblies with extended bearing hubs optimised for use in mixer and agitator applications (below). The gearboxes are available with solid or hollow shafts in sizes from 67–157 and with overhung load capabilities from 25–176kN. They can be used with motors from 0.12–90kW. The Taiwanese collaborative robot manufacturer Techman, which has recently formed an alliance with Omron, launched a cobot arm at Hannover which, it claims, offers a bigger payload capacity than any other arm of a similar length. The TM12 arm has a working range of 1.3m and capacity of up to 12kg. Like other Techman cobots, it has a built-in vision recognition system, making it ideal for applications such as loading and unloading materials. Programming for visual recognition and pick-and-place activities is said to take less than three minutes. Yamaha Motor made its Hannover debut with a demonstration of Advanced Robotics Automation Platform – said to allow complex production facilities to be set up rapidly at low cost ­– with its high-speed, high-accuracy YK400XR Scara robot. The digital platform can control multiple robots and peripheral devices. ifm electronic has squeezed its photoelectric time-of-flight technology into an M18 format for the first time. Its PMD OGD Cube sensor (below) uses laser beams to measure distances. There are two versions: OGD Precision with a range of 300 or 500mm; and OGD Long Range with a range of 1.5m. The sensors can be used for applications such as detecting big objects, error-proofing and checking the depth of bore holes. IO-Link interfaces can be used to transfer measured values and set parameters remotely. Time-of-flight is also the basis of a new 3D camera developed by ifm’s subsidiary, pmd technologies. The IP54-protected O3X camera has a resolution of 224 x 172 pixels and an image repetition rate of 20Hz. It can detect objects at a distance of 4m. 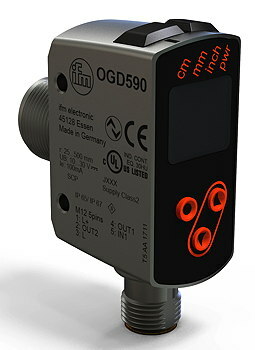 ifm also announced a sensor that continuously detects the position of valves – open, closed or intermediate. It can detect even small position changes of end positions in the valve, and provide condition values via an IO-Link interface. Pepperl+Fuchs has released a series of laser-based photoelectric sensors with long operating ranges. The R200 and R201 sensors are available in various versions including: through-beam sensors; retroreflective sensors with polarisation filters; diffuse mode sensors for clear objects; sensors with background and foreground suppression; and measuring light barriers with two switching points. They incorporate IO-Link and three LEDs for visualising the configuration, status and diagnostics. Schunk announced a compact (82mm diameter) six-axis torque/force sensor, intended mainly for use on small robots. The FT-Axia sensors offer two measurement ranges for forces up to 900N and torque levels up to 20Nm, with resolutions of 0.1N and 0.05Nm. “Intelligence” is built in, avoiding the need for external processors. On its pavilion at Hannover, the Industrial Internet Consortium (IIC) had three testbed demonstrations: its Time-Sensitive Networking (TSN) for Flexible Manufacturing testbed; its Smart Factory Web testbed; and its Security Claims Evaluation testbed. The first uses enhanced Ethernet to support real-time control and synchronisation of high-performance machines over a standard Ethernet network. The second creates a network of smart factories with flexible adaptation of production capabilities and shared resources and assets. The third offers an easy-to-configure, open cyber-security platform for evaluating endpoint, gateway and other networked components’ security capabilities. Murrelektonik was showing a new line of compact, rugged I/O modules said to simplify field installations. The Solid67 modules (below) provide eight IO-Link slots close to a process and can also incorporate classic I/O. They support Profinet and Ethernet/IP in one module, selected by a rotary switch, thus simplifying stock-keeping and cutting costs. The L-coded M12 power lines can handle up to 12A, and the modules can be daisy-chained to provide power where it is needed. The range includes space-saving 30mm-wide versions. Phoenix Contact revealed an IoT gateway that links to its Proficloud platform without needing to interfere with the automation technology. Sensor and process data can be gathered, encrypted and sent to cloud applications for further processing. The gateway can also send data from existing installations to applications such as condition monitoring, pattern recognition and big data analysis. Phoenix was also showing new 16-port versions of its FL Switch 2000 managed switches designed to accommodate the increasing number of Ethernet devices in automation networks. The switches offer up to four fibre ports, combination ports and various fibre connection methods. There are also Gigabit versions. A new power supply connector using push-in technology speeds installation. The Dutch Profibus and Profinet specialist Procentec launched its latest tablet-based diagnostics system for troubleshooting Profibus networks. Called Mercury, it can be used to monitor and maintain Ethernet and Profibus networks. It combines the capabilities of Procentec’s ProfiTrace and Atlas products. Profibus and Profinet International (PI) had a demonstration showing how TSN (Time-Sensitive Networking) can be integrated into Profinet. The demo consisted of a TSN network with a topology that changes at run-time without needing to reconfigure the network – an advantage over today’s IRT or static TSN configurations. The demo also showed the integration of existing Profinet networks and devices. PI is now drawing up specifications for integrating TSN into Profinet, with the goal of completing this by the time of the 2019 Hannover Fair. Bosch Rexroth showed the third version of its IoT Gateway with enhancements including local monitoring (allowing local visualisation of production data) and secure remote maintenance using encrypted data transmission and improved protection of machine networks. The gateway is now available in pre-configured, plug-and-play rack format that can be implemented immediately in production environments. Rexroth has been collaborating with partners including Amazon Web Services and Oracle to offer cloud-based applications to analyse, visualise and store data collected by the gateway. Hannover 2018 marked to the first public outing of Siemens’ Mindsphere World user organisation, which was established in January. Members – which include ASM, Balluff, Festo, Kuka, Rittal and Sick – were demonstrating IoT systems and applications that are using the Mindsphere cloud platform. One of the demonstrations was a development by researchers from the University of Manchester of a low-cost technique for optimising pneumatic systems using data analysis. Siemens reports that it is considering applications from a further 20 prospective members of the organisation. Softing unveiled a gateway that allows easy, secure integration of process- and machine data from Modbus PLCs with IoT and Industry 4.0 systems. The dataFeed uaGate MB gateway provides access to process and machine data via OPC UA and the MQTT protocol. It supports IT security standards such as SSL encryption and X.509 certificates, and it can connect multiple applications in parallel. The gateway also supports hybrid architectures, running partly on premises, partly in the cloud. Eplan used Hannover to preview version 2.8 of its Cogineer Advanced automation software, due for release later this year, which it will offer a “software as a service (SaaS)” model, with the two functional areas – Designer and Project Builder – usable only as cloud-based services with separate licences. New functions include: a facility for importing configurations in the XML format; the ability to instance typical elements and select partial functions or circuits during configuration; and an assistant to simplify the input of formulae. Eplan also announced a service called Store Share View that will save projects to the cloud, where they can be shared with other participants, and viewed at any time. Based on Microsoft Azure, the service will give users a central source for making Eplan data available easily to anyone involved in a project. 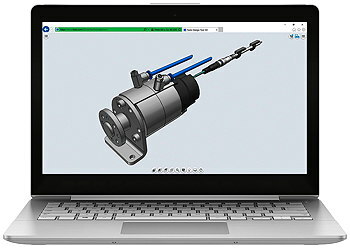 Festo’s Design Tool 3D, which it launched in a downloadable version in 2014, is now also available in an online version which does not need to be downloaded and installed locally. The configuration tool (below) allows users to select products in a 3D view and generate product combinations. It reduces the risks of errors when designing and ordering system modules. The new Web version is integrated into Festo’s product catalogue, making it easier to design and order pre-assembled modules. The French software group, IGE+XAO, recently acquired by Schneider Electric, unveiled a new version of its SEE Electrical Expert package with improved communications between disciplines for easier collaboration. V4R3 of the software also offers new communications interfaces and component labelling functions for exporting panel manufacturing data. IGE+XAO also revealed a new Web service, called SEE Gen e-doc, which generates and manages electric systems documentation, and can build documentation on the fly. Lenze announced that its i500 series of frequency inverters are now integrated into Eplan’s Data Portal, offering 2D and 3D datasets and product data to help design control cabinets. It is possible to customise cable harnesses, including their connections, automatically. 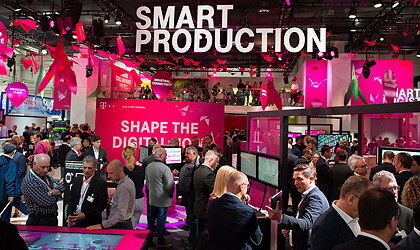 Among the technologies and products that Rockwell Automation was demonstrating at Hannover was its new FactoryTalk Analytics software – originally piloted at Project Scio last year – which discovers, scales and connects data sources from the edge of a network up through an enterprise. It fuses the information to solve production issues almost immediately. It also learns a process and looks for data trends, offering insights to users before issues arise. Schaeffler presented four examples of how its Smart EcoSystem provides the IT infrastructure for integrating smart components in bearing applications, and offers visualisation and analysis tools. The company’s Industry 4.0 packages are tailored to suit an application. Schneider Electric took part in five proof-of-concept collaborations at Hannover aimed at demonstrating how open architectures can unlock the full potential of the Internet of Things. It believes that by driving the next generation of unified communications from devices to the cloud, networks can be simplified and users can choose off-the-shelf technologies to cut integration and maintenance costs. The company was promoting its EcoStruxure for Industry open, interoperable IoT platform that offers a unified approach to engineering that can be deployed across many sectors of industry. Sick presented its AppPool – a secure, cloud-based marketplace for its SensorApps, which also simplifies and drives collaboration within the community of OEMs, integrators, programmes and developers. The AppPool supports them in creating their own SensorApps for use with Sick’s programmable sensors. Siemens unveiled version 5.1 of its TIA Portal which includes new simulation and virtual commissioning options using digital twins of its Simatic S7-1500 controllers. Complete machines can be simulated and validated without needing real prototypes, allowing errors to be spotted and corrected before installation. Commissioning of S7-1500 controllers is said to be faster than before, and support has been added for the new Simatic S7-1500R/H redundant CPUs. TIA Portal V15.1 also supports Sinamics S210 servodrives with a tool that for parameterisation, commissioning and diagnostics. There is also enhanced support for OPC UA controller-to-controller communications. Siemens also announced three new MindApps for its MindSphere cloud-based open IoT platform. The Machine Monitor app creates transparency on the status and performance of machines. The Notifier app allows users to visualise messages about their machines and to access alarm data from any locations. And the Performance Monitor app is intended to improve the availability and productivity of manufacturing facilities by calculating and visualising machine and system KPIs. 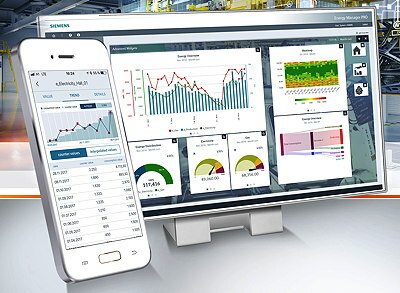 Finally, Siemens also launched several enhancements to its energy monitoring portfolio including the Simatic Energy Manager Basic v7.1 package (below) which offers entry-level energy management functions and offers customised dashboards and reports. There is also a iOS or Android app (called Simatic Energy Manager v1.0) that provides mobile recording of consumption data that cannot be networked using an energy monitoring system. The next Hannover Fair will take place from 1–5 April, 2019.